U.S. oil: From boom to bust? North Dakota's oil boom has gone bust, leaving the state government with a gaping $1 billion hole in its two-year budget. Plunging oil prices are a massive problem for a tiny state like North Dakota. The shortfall, released in new budget estimates on Monday, represents more than 20% of its tax revenues for the budget cycle that started last July. The state is scrambling to come up with spending cuts, and dipping into savings in order to keep its government up and running. More than 200 oil rigs were up and running in North Dakota during the boom times a few years ago. But that figure has dwindled to just 44 rigs operating today, and that's been a huge drain on the state's sales tax revenue. 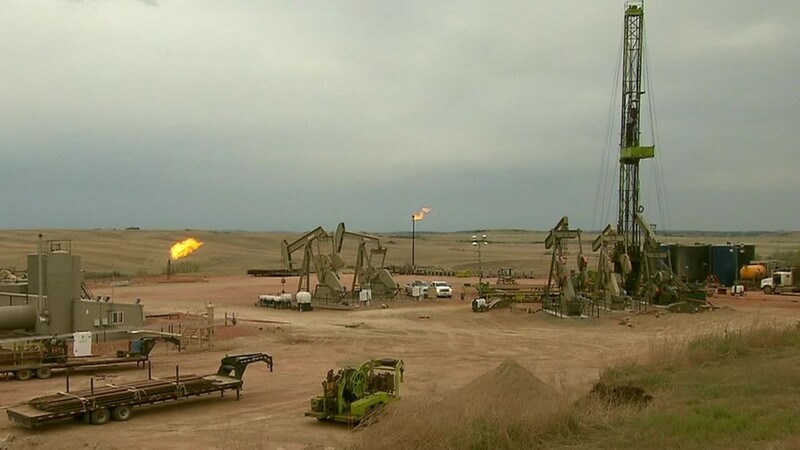 "A lot of the materials the rigs use -- the fracking sand, the piping, the cement -- all that is subject to sales tax," said state budget analyst Allen Knudson. "Our unemployment rate is still under 3%, and people are still looking for help," Knudson said. "But some of the oil field workers who came here during the boom have gone home." To cover the shortfall, the state has dipped into a rainy-day fund and wiped out budget surpluses created during the good times. In addition, Gov. Jack Dalrymple Monday ordered every department in the state government to trim at least 4% out of their budgets. North Dakota is not the only oil-producing state facing budget problems. Oklahoma Gov. Mary Fallin said Monday that her state also faces a $1 billion budget hole. Last month, Alaska Gov. Bill Walker announced a state hiring freeze and limits on travel as part of an effort to control a growing $3.5 billion budget gap. He had previously proposed Alaska's first state income tax in 35 years.